Type 2 diabetes is by no means a novel disease. No definite description of diabetes can be found in the Corpus Hippocraticum or in the subsequent European literature, except inconclusive descriptions by Galenus and Aretaios. It took centuries before the sweet taste of urine in diabetes was described by Thomas Willis (in 1674) and sugar in the urine was identified by Matthew Dobson (in 1776). In contrast, a large body of evidence points to the common presence and diagnosis of diabetes in ancient India and China, presumably the result of genetics and lifestyle - and acumen of the respective physicians. The characteristic sweet urine in diabetes was mentioned in the Indian Sanskrit medicine literature  presumably written between 300 before and 600 after Chr. The ancient physicians described "sugar cane urine" (Iksumeha) or "honey urine" (Madhumeha and Hastimeha) as well as "urine flow like elephant in heat"; furthermore, they mentioned the observation that ants and insects rush to this type of urine - suggesting that the observations concerned true glucosuria and diabetes. The ancient Indian physicians ascribed this condition to excessive food intake and insufficient exercise; they also mentioned the complete list of the three cardinal symptoms: polyphagia, polyuria and polydispsia; even secondary sequelae of diabetes such as abscess formation, carbuncles, lassitude and floppiness were reported. Suggested interventions ranged from administration of honey and sugar in patients with Iksumeha and Mathumeha (illogical, but possibly envisaged as substitution therapy) to the (very rational) advice of active physical exercise with long marches and riding on elephants [Schadtewaldt H., Geschichte des Diabetes Mellitus (History of Diabetes Mellitus), Springer, Berlin-Heidelberg-New York 1975]. In China, the earliest description of diabetes as "xiao-ke" (wasting thirst or emaciation and thirst) syndrome can be traced back more than 2000 years ago to the Yellow Emperor's Classic of Medicine (Huangdi Neijing) [Deng, Y.Y. and Y.P. Chen, Diabetic nephropathy. In: Wang G., Y.P. Chen and Y.Q. Zou, eds. Contemporary nephrology in traditional Chinese medicine (p.585-602). Beijing: People's Medical Publishing House, 2003 (in Chinese)]. Ancient Chinese physicians had noted that « sweet » urine was a manifestation of this disease, which was further classified into upper (characterized by thirst and polydipsia), middle (characterized by hunger and polyphagia) and lower (characterized by thirst and polyuria) subtypes based on different manifestations [Shen, Q.F. (ed), Clinical nephrology in traditional Chinese medicine. Shanghai: Shanghai Scientific and Technological Literature Publishing house, 1997 (in Chinese)]. In addition, the ancient Chinese literature documented the complications of xiao-ke (e.g., skin abscesses, infections, blindness, turbid urine and edema) and ascribed its pathogenesis to improper fatty, sweet and rich diet, emotional imbalance and physical or sexual overindulgence (Liu Z.W., Liu L.(eds)Essentials of Chinese Medicine, New York, Springer 2009). Diet therapy, exercise, herbal medicine and acupuncture were proposed by ancient Chinese physicians centuries ago [Gao Y.B.(ed.) Ancient and contemporary case reports on diabetes mellitus. Beijing, The people's Military Medical Press, (2005) (Chinese)]. These observations, relatively specific and strong in India, but also very suggestive in China, indicate that diabetes had been known in Asia for a long time. The root of the problem is the current lifestyle causing visceral obesity; the long-term solution must be changes in lifestyle. ,, Disappointingly, a recent 6-year lifestyle intervention study while improving the risk of retinopathy failed to improv[e the risk of nephropathy,  but interventions of longer duration may be necessary - illustrating the magnitude of the problem. Nevertheless, the dramatic increase of advanced diabetic nephropathy in type 2 diabetes requires additional measures targeted more specifically to the kidney. The prevalence of diabetic nephropathy is aggravated by today's decreased cardiovascular mortality of diabetic individuals so that ever more patients reach the stage of advanced nephropathy. Fortunately, in the recent years - apart from better metabolic control of diabetes - specific nephroprotective interventions have become available. Until the 19 th century, type 2 diabetes was relatively infrequent in Europe and elsewhere. With increasing wealth and increasing prevalence of obesity, a progressive increase in the frequency of type 2 diabetes was noted. Proteinuria in type 2 diabetes had been well known in the 19 th century, but ESRD in type 2 diabetic patients was relatively uncommon because most patients died of cardiovascular events or other, mostly infectious, complications. Diabetic nephropathy in type 2 diabetes emerged relatively late as an issue. primary kidney disease with superimposed diabetes in 27%. It is therefore important not to automatically diagnose diabetic nephropathy in all type 2 diabetic patients with ESRD but to take a careful history, to examine the urinary sediment, etc. to exclude other renal diseases. Our observation that a certain proportion of type 2 diabetic patients with ESRD have little or no proteinuria is in line with many recent reports that a sizable proportion of diabetic patients with reduced eGFR has no albuminuria. In the UKPDS study, after 15 years of follow-up, 28% had developed an eGFR <60 ml/min and 14% had no albuminuria;  similar data were reported from the US. A recent 7.5-year prospective study showed that the presence of cerebral microinfarcts, documented by brain magnetic resonance imaging, predicted subsequent doubling of serum creatinine or dialysis dependency in diabetic patients with no microalbuminuria  - suggesting that this nonproteinuric type of renal malfunction is the result of arteriolopathy. More recently, we have seen with increasing frequency type 2 diabetic patients presenting with further modes of terminal renal failure. Type 2 diabetic patients with CKD are much more prone to develop superimposed acute kidney injury (AKI) ("acute on chronic kidney disease"), often triggered by infections, administration of radiocontrast, hypovolemia, etc. AKI in type 2 diabetic patients is associated with a high mortality. In a certain proportion of patients, the AKI is irreversible. Patients who recover from AKI subsequently exhibit frequently delayed progression to terminal renal failure  so that follow-up controls are obligatory. Another important point is that in our series, in 11% of the patients in whom the oral glucose tolerance test documented the presence of type 2 diabetes, the referring physician had been unaware of the diagnosis of type 2 diabetes. Interestingly, in the US Registry (USRDS) 10% or more of the patients on dialysis developed apparently de novo diabetes in the first 2 years of hemodialysis. Presumably in the preterminal stage of uremia, because of weight loss and anorexia, many patients with type 2 diabetes are no longer hyperglycemic in the fasting state. The underlying type 2 diabetes can only be documented, if at all, by the oral glucose tolerance test and/or the finding of diabetic complications. The best data on the natural history of diabetic nephropathy in type 2 diabetes are provided by the UKPDS study:  in a cohort of 5097 subjects, the annual rate of progression from normo-to-microalbuminuria was 2%, from micro-to-macroalbuminuria was 2.8% and from macroalbuminuria to elevation of serum creatinine was 2.3%.The annual death rate was 0.7% in normo-, 2.0% in micro- and 3.5% in macroalbuminuric patients and was 12.1% in those with elevated serum creatinine. In the ARIC study, HbA1 c was a powerful predictor of diabetic nephropathy. It is specifically glycemia in the first 10 years of type 2 diabetes that determines the long-term cardiovascular and renal outcome as first found by Pirart  and confirmed by numerous other studies. The UKPDS study showed that even a limited period of stringent glycemic control early on lowered the risk of microvascular disease after 10 years by almost 20%. The explanation for this "glycemic memory" or "legacy" effect is mainly the epigenetic modification of genomic DNA,  which causes permanent modification of transcription. "Glycemic memory" and its time course is illustrated by an interesting observation in type 1 diabetic patients. Morath , studied the long-term survival of type 1 diabetic patients who had either received simultaneous pancreas kidney transplantation, live donor kidney transplantation or cadaver kidney transplantation. 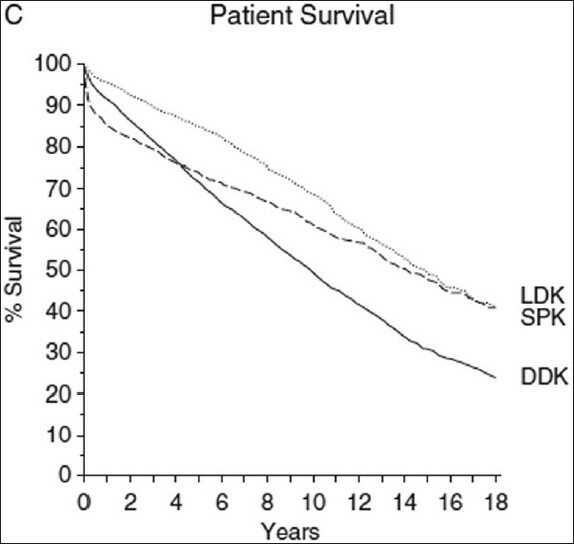 It took years before patients with simultaneous pancreas kidney transplantation (and subsequent normoglycemia) showed a survival advantage as compared with live donor kidney transplantation, a result of less cardiovascular events [Figure 1]. With respect to achieving lower HbA1 c values, the main available strategies are either to provide insulin or to sensitize the response to insulin. This has implications for the evolution of diabetic nephropathy. The administration of insulin is associated with weight gain and a greater risk of weight gain and of hypoglycemia. The risk of hypoglycemia is considerably greater in patients with advanced reduction of GFR, because of increased insulin half-life on the one hand and less renal production of glucose to counteract hypoglycemia on the other hand. To limit the discussion to type 2 diabetic patients with kidney disease, two relatively novel forms of glycemic control are of specific interest, i.e. glitazones and SGLT2 inhibitors. Currently, there are ongoing discussions concerning the optimal technique of blood pressure measurement as well as the appropriate target blood pressure. The study of Kamoi  showed that compared with clinic blood pressure measurement, self-measurement of blood pressure by the patient in the morning predicted much better diabetic complications, i.e. nephropathy, retinopathy and coronary heart disease. Therefore, patients should be educated to measure their own blood pressure. It is of interest that in type 1 diabetes, high night-time blood pressure preceded the onset of microalbuminuria  and in type 2 diabetes, nocturnal blood pressure elevation also predicted the progression of albuminuria;  these observations illustrate the potential usefulness of 24-h blood pressure measurements. There has also been some recent discussion on whether lowering the systolic blood pressure by antihypertensive medication actually provided any benefit in type 2 diabetes. A metaanalysis of Mancia  showed that in almost all studies, benefit with respect to endpoints was significantly greater in patients randomized to more-intensive blood pressure lowering compared with less-intensive blood pressure lowering. In the ADVANCE study,  further reduction of blood pressure reduced renal events when the blood pressure was lowered in individuals with baseline systolic blood pressure <120 mmHg. These patients had limited target organ damage. Aggressive blood pressure lowering may no longer be safe in more advanced stages with higher cardiovascular and renal damage. In the IDNT study, Berl  found that the lower the diastolic blood pressure, the higher the risk of myocardial infarction [Figure 2]; in patients with coronary heart disease or other cardiac disease, coronary perfusion (which occurs only during diastole) may be compromised if the diastolic blood pressure is low. 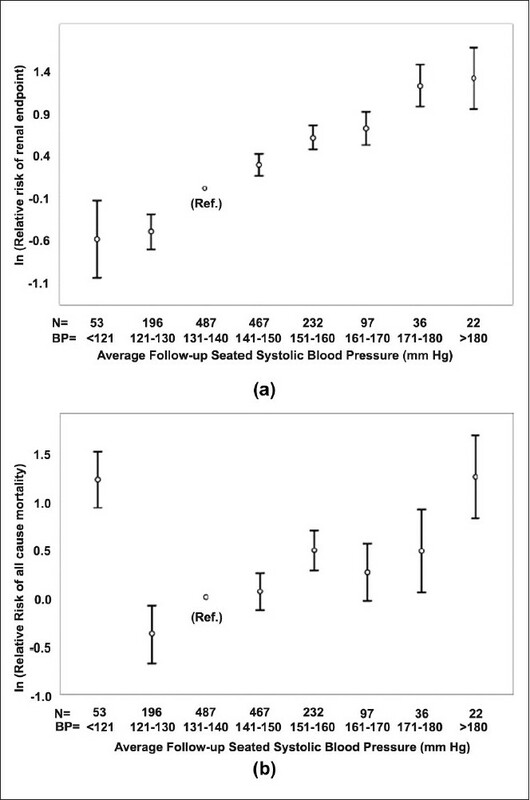 In the ONTARGET study,  in patients at high cardiovascular risk, the major primary endpoints were more frequent if the baseline systolic blood pressure was <130 mmHg. In diabetes, the renin-angiotensin system (RAS) is activated. Blockade of the RAS by ACE inhibitors or angiotensin receptor blockers reduces proteinuria. A metaanalysis by Jafar (73) showed that RAS blockade did not only lower proteinuria but also caused significant reduction of progression at least in patients with baseline urinary protein excretion >1 g/day. The same has been shown for angiotensin receptor blockers. ,, Thus, RAS blockade is certainly indicated in proteinuric type 2 diabetic patients. It would be wrong, however, to assume that RAS blockade per se is sufficient. 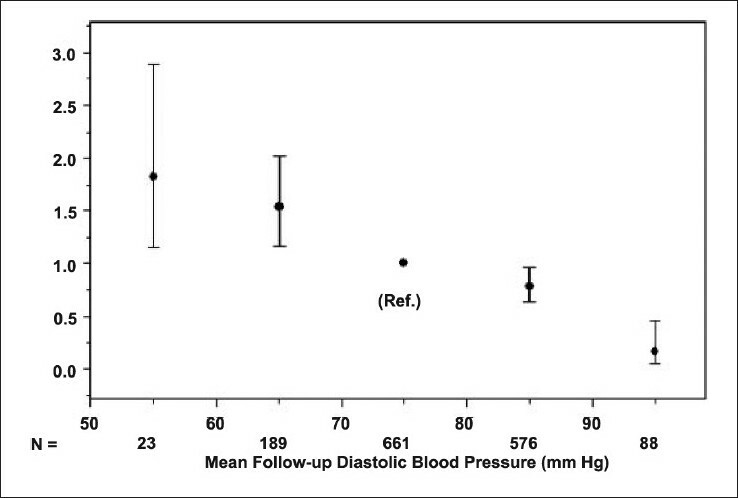 As shown in [Figure 3],  the effect of lowering blood pressure in the Amlodipine arm of the study was greater than the effect of RAS blockade in the Irbesartan arm. Apart from insufficient lowering of 24-h blood pressure (including nighttime blood pressure), further causes of insufficient reduction of proteinuria are excessive NaCl intake, insufficient diuretic dose (in proteinuric patients, protein-bound diuretics fail to block Na + reabsorption) and aldosterone "escape". Unfortunately, monotherapy is usually insufficient to achieve target blood pressure values. This raises the issue, which additional antihypertensive agents should be combined with RAS blockade. The ACCOMPLISH trial showed that benazepril plus hydrochlorothiazide was less effective in reducing renal events than benazepril plus amlodipine. Nevertheless, reduction of dietary sodium intake  and diuretics is usually required in diabetic patients with impaired renal function. What is the evidence that in advanced diabetic nephropathy, progression to end-stage kidney disease can be influenced. A frequent problem in diabetic nephropathy is inadequate reduction of proteinuria or initial successful lowering with a secondary increase in proteinuria, the so-called "escape" phenomenon. In the patient with escape, the following approaches are available to the physician [Table 1]. Salt restriction causes upregulation of the RAS and increases the response to RAS blockade. Patients must be educated to reduce salt intake, and this should be monitored by measuring the 24-h urine sodium excretion. The doses of diuretics should be adapted to the magnitude of proteinuria (diuretics are protein-bound and act from within the tubular lumen); the presence of proteinuria in the effective free (nonprotein-bound) concentration is reduced. The escape phenomenon is linked to an increase in aldosterone concentrations. A number of studies ,,, showed that Spironolactone or Eplerenone, i.e. mineralocorticoid receptor blockers, reduce the risk of escape and can achieve reversal of escape. An investigational drug is currently the renin inhibitor Aliskiren, which has been shown to reduce proteinuria,  and a current study examines whether progressive loss of GFR can be beneficially affected. In animal experiments, endothelin receptor blockers were highly effective in diabetic nephropathy. We had shown that relatively low doses of the endothelin A receptor blocker, Avosentan, reduce albuminuria in early stages of type 2 diabetes with nephropathy. Unfortunately, patients with more advanced diabetic nephropathy and treated with relatively high doses with Avosentan had major side-effects mostly related to sodium retention, and fluid overload was noted. The novel, more ETA receptor-selective blocker Atrasentan appears to be promising in this indication (Kohan, JASN in press). In preclinical trials, further approaches such as renin receptor inhibitors, AT2 receptor agonists and chymase inhibitors are under examination. 1. Frank LL. Diabetes mellitus in the texts of old Hindu medicine (Charaka, Susruta, Vagbhata). Am J Gastroenterol 1957;27:76-95. 2. Kaur P, Radhakrishnan E, Rao SR, Sankarasubbaiyan S, Rao TV, Gupte MD. The metabolic syndrome and associated risk factors in an urban industrial male population in South India. J Assoc Physicians India 2010;58:363-6, 371. 3. Zimmet P, KG Alberti, J Shaw. Global and societal implications of the diabetes epidemic. Nature 2001;414:782-7. 4. Ramachandran A, Ma RC, Snehalatha C. Diabetes in Asia. Lancet 2010;375:408-18. 5. Yoon KH, Lee JH, Kim JW, Cho JH, Choi YH, Ko SH, et al. Epidemic obesity and type 2 diabetes in Asia. Lancet 2006;368:1681-8. 6. Sridhar GR, Putcha V, Lakshmi G. Time trends in the prevalence of diabetes mellitus: Ten year analysis from southern India (1994-2004) on 19,072 subjects with diabetes. J Assoc Physicians India 2010;58:290-4. 7. Mohan V, Sandeep S, Deepa R, Shah B, Varghese C. Epidemiology of type 2 diabetes: Indian scenario. Indian J Med Res 2007;125:217-30. 8. Raman R, Gupta A, Pal SS, Ganesan S, Venkatesh K, Kulothungan V. Prevalence of metabolic syndrome and its influence on microvascular complications in the Indian population with Type 2 diabetes mellitus. Sankara Nethralaya Diabetic Retinopathy Epidemiology And Molecular Genetic Study (SN-DREAMS, report 14). Diabetol Metab Syndr 2010;2:67. 9. Mohan V, Shanthirani CS, Deepa R. Glucose intolerance (diabetes and IGT) in a selected South Indian population with special reference to family history, obesity and lifestyle factors--the Chennai Urban Population Study (CUPS 14). J Assoc Physicians India 2003;51:771-7. 10. Ravikumar P, Bhansali A, Walia R, Shanmugasundar G, Ravikiran M. Alterations in HbA(1c) with advancing age in subjects with normal glucose tolerance: Chandigarh Urban Diabetes Study Group. Diabet Med 2011 [In Press]. 11. Goyal RK, Shah VN, Saboo BD, Phatak SR, Shah NN, Gohel MC, et al. Prevalence of overweight and obesity in Indian adolescent school going children: Its relationship with socioeconomic status and associated lifestyle factors. J Assoc Physicians India 2010;58:151-8. 12. Deepa M, Pradeepa R, Rema M, Mohan A, Deepa R, Shanthirani S, et al. The Chennai Urban Rural Epidemiology Study (CURES)--study design and methodology (urban component) (CURES-I). J Assoc Physicians India 2003;51:863-70. 13. Abdul FB. Type 2 diabetes and rural India. Lancet, 2007;369:273-4. 14. Gupta SK, Singh Z, Purty AJ, Kar M, Vedapriya D, Mahajan P, et al. Diabetes prevalence and its risk factors in rural area of Tamil Nadu. Indian J Community Med 2010;35:396-9. 15. Jonas JB, Panda-Jonas S, Nangia V, Joshi PP, Matin A. Diabetes mellitus in rural India. Epidemiology 2010;21:754-5. 16. Pradeepa R, Anjana RM, Unnikrishnan R, Ganesan A, Mohan V, Rema M. Risk factors for microvascular complications of diabetes among South Indian subjects with type 2 diabetes--the Chennai Urban Rural Epidemiology Study (CURES) Eye Study-5. Diabetes Technol Ther 2010;12:755-61. 17. Agarwal SK, RK Srivastava. Chronic kidney disease in India: Challenges and solutions. Nephron Clin Pract 2009;111:c197-203. 18. Jha V. Current status of end-stage renal disease care in South Asia. Ethn Dis 2009;19:S1-27-32. 19. Modi GK, Jha V. The incidence of end-stage renal disease in India: A population-based study. Kidney Int 2006;70:2131-3. 20. Aggarwal HK, Yashodara BM, Nand N, Sonia, Chakrabarti D, Bharti K. et al. Spectrum of renal disorders in a tertiary care hospital in Haryana. J Assoc Physicians India 2007;55:198-202. 21. Prakash J, Hota JK, Singh S, Sharma OP. Clinical spectrum of chronic renal failure in the elderly: A hospital based study from eastern India. Int Urol Nephrol 2006;38:821-7. 22. Unnikrishnan RI, Rema M, Pradeepa R, Deepa M, Shanthirani CS, Deepa R, et al. Prevalence and risk factors of diabetic nephropathy in an urban South Indian population: The Chennai Urban Rural Epidemiology Study (CURES 45). Diabetes Care 2007;30:2019- 24. 23. Schwenger V, Müssig C, Hergesell O, Zeier M, Ritz E. Incidence and clinical characteristics of renal insufficiency in diabetic patients. Dtsch Med Wochenschr 2001;126:1322-6. 24. Soni SS, Gowrishankar S, Kishan AG, Raman A. Non diabetic renal disease in type 2 diabetes mellitus. Nephrology (Carlton) 2006;11:533-7. 25. Gray LJ, Tringham JR, Davies MJ, Webb DR, Jarvis J, Skinner TC, et al. Screening for type 2 diabetes in a multiethnic setting using known risk factors to identify those at high risk: A cross-sectional study. Vasc Health Risk Manag 2010;6:837-42. 26. Lightstone L, Rees AJ, Tomson C, Walls J, Winearls CG, Feehally J, et al. High incidence of end-stage renal disease in Indo-Asians in the UK. QJM 1995;88:191-5. 27. Barbour SJ, Er L, Djurdjev O, Karim M, Levin A. Differences in progression of CKD and mortality amongst Caucasian, Oriental Asian and South Asian CKD patients. Nephrol Dial Transplant 2010;25:3663-72. 28. Wilkinson E, Randhawa G, Farrington K, Greenwood R, Feehally J, Choi P, et al. Lack of awareness of kidney complications despite familiarity with diabetes: A multi-ethnic qualitative study. J Ren Care 2011;37:2-11. 29. Geneau R, Stuckler D, Stachenko S, McKee M, Ebrahim S, Basu S, et al. Raising the priority of preventing chronic diseases: A political process. Lancet 2010;376:1689-98. 30. Tuomilehto J, Lindström J, Eriksson JG, Valle TT, Hämäläinen H, Ilanne-Parikka P, et al. Prevention of type 2 diabetes mellitus by changes in lifestyle among subjects with impaired glucose tolerance. N Engl J Med 2001;344:1343-50. 31. Gong Q, Gregg EW, Wang J, An Y, Zhang P, Yang W, et al. Long-term effects of a randomised trial of a 6-year lifestyle intervention in impaired glucose tolerance on diabetes-related microvascular complications: The China Da Qing Diabetes Prevention Outcome Study. Diabetologia 2011;54:300-7. 32. Ritz E, Rychlík I, Locatelli F, Halimi S. End-stage renal failure in type 2 diabetes: A medical catastrophe of worldwide dimensions. Am J Kidney Dis 1999;34:795-808. 33. Stel VS, Tomson C, Ansell D, Casino FG, Collart F, Finne P, et al. Level of renal function in patients starting dialysis: An ERA-EDTA Registry study. Nephrol Dial Transplant 2010;25:3315-25. 34. Pavkov ME, Knowler WC, Bennett PH, Looker HC, Krakoff J, Nelson RG. Increasing incidence of proteinuria and declining incidence of end-stage renal disease in diabetic Pima Indians. Kidney Int 2006;70:1840-6. 35. MacIsaac RJ, Tsalamandris C, Panagiotopoulos S, Smith TJ, McNeil KJ, Jerums G. Nonalbuminuric renal insufficiency in type 2 diabetes. Diabetes Care 2004;27:195-200. 36. Retnakaran R, Cull CA, Thorne KI, Adler AI, Holman RR, UKPDS Study Group. Risk factors for renal dysfunction in type 2 diabetes: U.K. Prospective Diabetes Study 74. Diabetes 2006;55:1832-9. 37. Kramer HJ, Nguyen QD, Curhan G, Hsu CY. Renal insufficiency in the absence of albuminuria and retinopathy among adults with type 2 diabetes mellitus. JAMA 2003;289:3273-7. 38. Uzu T, Kida Y, Shirahashi N, Harada T, Yamauchi A, Nomura M, et al. Cerebral microvascular disease predicts renal failure in type 2 diabetes. J Am Soc Nephrol 2010;21:520-6. 39. Wald R, Quinn RR, Luo J, Li P, Scales DC, Mamdani MM, et al. Chronic dialysis and death among survivors of acute kidney injury requiring dialysis. JAMA 2009;302:1179-85. 40. Adler AI, Stevens RJ, Manley SE, Bilous RW, Cull CA, Holman RR. Development and progression of nephropathy in type 2 diabetes: The United Kingdom Prospective Diabetes Study (UKPDS 64). Kidney Int 2003;63:225-32. 41. Halimi JM, Bonnet F, Lange C, Balkau B, Tichet J, Marre M. Urinary albumin excretion is a risk factor for diabetes mellitus in men, independently of initial metabolic profile and development of insulin resistance. The DESIR Study. J Hypertens 2008;26:2198-206. 42. Altiparmak MR, Pamuk ON, Pamuk GE, Apaydin S, Ozbay G. Diffuse diabetic glomerulosclerosis in a patient with impaired glucose tolerance: Report on a patient who later develops diabetes mellitus. Neth J Med 2002;60:260-2. 43. Souraty P, Nast CC, Mehrotra R, Barba L, Martina J, Adler SG. Nodular glomerulosclerosis in a patient with metabolic syndrome without diabetes. Nat Clin Pract Nephrol 2008;4:639-42. 44. Brantsma AH. Bakker SJ, Hillege HL, de Zeeuw D, de Jong PE, Gansevoort RT. Urinary albumin excretion and its relation with C-reactive protein and the metabolic syndrome in the prediction of type 2 diabetes. Diabetes Care 2005;28:2525-30. 45. Ninomiya T, Perkovic V, de Galan BE, Zoungas S, Pillai A, Jardine M, et al. Albuminuria and kidney function independently predict cardiovascular and renal outcomes in diabetes. J Am Soc Nephrol 2009;20:1813-21. 46. de Fine Olivarius N, Siersma V, Nielsen AB, Hansen LJ, Rosenvinge L, Mogensen CE. Predictors of mortality of patients newly diagnosed with clinical type 2 diabetes: A 5-year follow up study. BMC Endocr Disord 2010;10:14. 47. Ruggenenti P, Remuzzi G. Time to abandon microalbuminuria? Kidney Int 2006;70:1214-22. 48. Hillege HL, Fidler V, Diercks GF, van Gilst WH, de Zeeuw D, van Veldhuisen DJ, et al. Urinary albumin excretion predicts cardiovascular and noncardiovascular mortality in general population. Circulation 2002;106:1777-82. 49. Solomon SD, Lin J, Solomon CG, Jablonski KA, Rice MM, Steffes M, et al. Influence of albuminuria on cardiovascular risk in patients with stable coronary artery disease. Circulation 2007;116:2687-93. 50. Gaede P, Tarnow L, Vedel P, Parving HH, Pedersen O. Remission to normoalbuminuria during multifactorial treatment preserves kidney function in patients with type 2 diabetes and microalbuminuria. Nephrol Dial Transplant 2004;9:2784-8. 51. Gross ML, Hanke W, Koch A, Ziebart H, Amann K, Ritz E. Intraperitoneal protein injection in the axolotl: The amphibian kidney as a novel model to study tubulointerstitial activation. Kidney Int 2002;62:51-9. 52. Tapp RJ, Shaw JE, Zimmet PZ, Balkau B, Chadban SJ, Tonkin AM, et al. Albuminuria is evident in the early stages of diabetes onset: Results from the Australian Diabetes, Obesity, and Lifestyle Study (AusDiab). Am J Kidney Dis 2004;44:792-8. 53. Stratton IM, Cull CA, Adler AI, Matthews DR, Neil HA, Holman RR. Additive effects of glycaemia and blood pressure exposure on risk of complications in type 2 diabetes: A prospective observational study (UKPDS 75). Diabetologia 2006;49:1761-9. 54. Yang YH, He XJ, Chen SR, Wang L, Li EM, Xu LY. Changes of serum and urine neutrophil gelatinase-associated lipocalin in type-2 diabetic patients with nephropathy: One year observational follow-up study. Endocrine 2009;36:45-51. 55. Miranda KC, Bond DT, McKee M, Skog J, Păunescu TG, Da Silva N, et al. Nucleic acids within urinary exosomes/microvesicles are potential biomarkers for renal disease. Kidney Int 2010;78:191-9. 56. Rossing K, Mischak H, Dakna M, Zürbig P, Novak J, Julian BA,et al. Urinary proteomics in diabetes and CKD. J Am Soc Nephrol 2008;19:1283-90. 57. Hovind P, Rossing P, Tarnow L, Johnson RJ, Parving HH. Serum uric acid as a predictor for development of diabetic nephropathy in type 1 diabetes: An inception cohort study. Diabetes 2009;58:1668-71. 58. Pirart J. Diabetes mellitus and its degenerative complications: A prospective study of 4,400 patients observed between 1947 and 1973 (3 rd and last part) (author's transl). Diabete Metab 1977;3:245-56. 59. Atkins RC, Briganti EM, Lewis JB, Hunsicker LG, Braden G, Champion de Crespigny PJ, et al. Proteinuria reduction and progression to renal failure in patients with type 2 diabetes mellitus and overt nephropathy. Am J Kidney Dis 2005;45:281-7. 60. Eijkelkamp WB, Zhang Z, Remuzzi G, Parving HH, Cooper ME, Keane WF, et al. Albuminuria is a target for renoprotective therapy independent from blood pressure in patients with type 2 diabetic nephropathy: Post hoc analysis from the Reduction of Endpoints in NIDDM with the Angiotensin II Antagonist Losartan (RENAAL) trial. J Am Soc Nephrol 2007;18:1540-6. 61. Araki S, Haneda M, Koya D, Hidaka H, Sugimoto T, Isono M, et al. Reduction in microalbuminuria as an integrated indicator for renal and cardiovascular risk reduction in patients with type 2 diabetes. Diabetes 2007;56:1727-30. 62. Schneider CA, Ferrannini E, Defronzo R, Schernthaner G, Yates J, Erdmann E, et al. Effect of pioglitazone on cardiovascular outcome in diabetes and chronic kidney disease. J Am Soc Nephrol 2008;19:182-7. 63. Bash LD, Selvin E, Steffes M, Coresh J, Astor BC. Poor glycemic control in diabetes and the risk of incident chronic kidney disease even in the absence of albuminuria and retinopathy: Atherosclerosis Risk in Communities (ARIC) Study. Arch Intern Med 2008;168:2440-7. 64. Holman RR, Paul SK, Bethel MA, Matthews DR, Neil HA. 10-year follow-up of intensive glucose control in type 2 diabetes. N Engl J Med 2008;359:1577-89. 65. Cooper ME, A El-Osta. Epigenetics: Mechanisms and implications for diabetic complications. Circ Res 2010;107:1403-13. 66. Morath C, Zeier M, Döhler B, Schmidt J, Nawroth PP, Opelz G. Metabolic control improves long-term renal allograft and patient survival in type 1 diabetes. J Am Soc Nephrol 2008;19:1557-63. 67. Morath C, Zeier M, Döhler B, Schmidt J, Nawroth PP, Schwenger V, et al. Transplantation of the type 1 diabetic patient: The long-term benefit of a functioning pancreas allograft. Clin J Am Soc Nephrol 2010;5:549-52. 68. Poulter NR. Blood pressure and glucose control in subjects with diabetes: New analyses from ADVANCE. J Hypertens Suppl 2009;27:S3-8. 69. Patel A, MacMahon S, Chalmers J, Neal B, Billot L, Woodward M, et al. Intensive blood glucose control and vascular outcomes in patients with type 2 diabetes. N Engl J Med 2008;358:2560-72. 70. Duckworth W, Abraira C, Moritz T, Reda D, Emanuele N, Reaven PD, et al. Glucose control and vascular complications in veterans with type 2 diabetes. N Engl J Med 2009;360:129-39. 71. Gerstein HC, Miller ME, Byington RP, Goff DC Jr, Bigger JT, Buse JB, et al. Effects of intensive glucose lowering in type 2 diabetes. N Engl J Med 2008;358:2545-59. 72. Skyler JS, Bergenstal R, Bonow RO, Buse J, Deedwania P, Gale EA, et al. Intensive glycemic control and the prevention of cardiovascular events: Implications of the ACCORD, ADVANCE, and VA diabetes trials: A position statement of the American Diabetes Association and a scientific statement of the American College of Cardiology Foundation and the American Heart Association. Diabetes Care 2009;32:187-92. 73. Erdmann E. Microalbuminuria as a marker of cardiovascular risk in patients with type 2 diabetes. Int J Cardiol 2006;107:147-53. 74. Sarafidis PA, Lasaridis AN, Nilsson PM, Pagkalos EM, Hitoglou-Makedou AD, Pliakos CI, et al. Ambulatory blood pressure reduction after rosiglitazone reatment in patients with type 2 diabetes and hypertension correlates with insulin sensitivity increase. J Hypertens 2004;22:1769-77. 75. Schernthaner G, Chilton RJ. Cardiovascular risk and thiazolidinediones--what do meta-analyses really tell us? Diabetes Obes Metab 2010;12:1023-35. 76. Nesto RW, Bell D, Bonow RO, Fonseca V, Grundy SM, Horton ES, et al. Thiazolidinedione use, fluid retention, and congestive heart failure: A consensus statement from the American Heart Association and American Diabetes Association. October 7, 2003. Circulation 2003;108:2941-8. 77. KanjanabuchT, Ma LJ, Chen J, Pozzi A, Guan Y, Mundel P, et al. PPAR-gamma agonist protects podocytes from injury. Kidney Int 2007;71:1232-9. 78. Yang HC, Deleuze S, Zuo Y, Potthoff SA, Ma LJ, Fogo AB. The PPARgamma agonist pioglitazone ameliorates aging-related progressive renal injury. J Am Soc Nephrol 2009;20:2380-8. 79. List JF, Woo V, Morales E, Tang W, Fiedorek FT. Sodium-glucose cotransport inhibition with dapagliflozin in type 2 diabetes. Diabetes Care 2009;32:650-7. 80. Bailey CJ, Gross JL, Pieters A, Bastien A, List JF. Effect of dapagliflozin in patients with type 2 diabetes who have inadequate glycaemic control with metformin: A randomised, double-blind, placebo-controlled trial. Lancet 2010;375:2223-33. 81. Hsu CY, McCulloch CE, Darbinian J, Go AS, Iribarren C. Elevated blood pressure and risk of end-stage renal disease in subjects without baseline kidney disease. Arch Intern Med 2005;165:923- 8. 82. Gress TW, Nieto FJ, Shahar E, Wofford MR, Brancati FL. Hypertension and antihypertensive therapy as risk factors for type 2 diabetes mellitus. Atherosclerosis Risk in Communities Study. N Engl J Med 2000;342:905-12. 83. Jandeleit-Dahm KA, Tikellis C, Reid CM, Johnston CI, Cooper ME. Why blockade of the renin-angiotensin system reduces the incidence of new-onset diabetes. J Hypertens 2005;23:463-73. 84. Tikellis C, Wookey PJ, Candido R, Andrikopoulos S, Thomas MC, Cooper ME. Improved islet morphology after blockade of the renin- angiotensin system in the ZDF rat. Diabetes 2004;53:989-97. 85. Kamoi K, Miyakoshi M, Soda S, Kaneko S, Nakagawa O. Usefulness of home blood pressure measurement in the morning in type 2 diabetic patients. Diabetes Care 2002;25:2218-23. 86. Lurbe E, Redon J, Kesani A, Pascual JM, Tacons J, Alvarez V, et al. Increase in nocturnal blood pressure and progression to microalbuminuria in type 1 diabetes. N Engl J Med 2002;347:797- 805. 87. Palmas W, Pickering T, Teresi J, Schwartz JE, Eguchi K, Field L, et al. Nocturnal blood pressure elevation predicts progression of albuminuria in elderly people with type 2 diabetes. J Clin Hypertens (Greenwich) 2008;10:12-20. 88. Mancia G, Laurent S, Agabiti-Rosei E, Ambrosioni E, Burnier M, Caulfield MJ, et al. Reappraisal of European guidelines on hypertension management: A European Society of Hypertension Task Force document. J Hypertens 2009;27:2121-58. 89. de Galan BE, Perkovic V, Ninomiya T, Pillai A, Patel A, Cass A, et al. Lowering blood pressure reduces renal events in type 2 diabetes. J Am Soc Nephrol 2009;20:883-92. 90. Berl T, Hunsicker LG, Lewis JB, Pfeffer MA, Porush JG, Rouleau JL, et al. Impact of achieved blood pressure on cardiovascular outcomes in the Irbesartan Diabetic Nephropathy Trial. J Am Soc Nephrol 2005;16:2170-9. 91. Sleight P, Redon J, Verdecchia P, Mancia G, Gao P, Fagard R, et al. Prognostic value of blood pressure in patients with high vascular risk in the Ongoing Telmisartan Alone and in combination with Ramipril Global Endpoint Trial study. J Hypertens 2009;27:1360-9. 92. Barnett AH, Bain SC, Bouter P, Karlberg B, Madsbad S, Jervell J, et al. Angiotensin-receptor blockade versus converting-enzyme inhibition in type 2 diabetes and nephropathy. N Engl J Med 2004;351:1952-61. 93. Lewis EJ, Hunsicker LG, Clarke WR, Berl T, Pohl MA, Lewis JB, et al. Renoprotective effect of the angiotensin-receptor antagonist irbesartan in patients with nephropathy due to type 2 diabetes. N Engl J Med 2001;345:851-60. 94. Brenner BM, Cooper ME, de Zeeuw D, Keane WF, Mitch WE, Parving HH, et al. Effects of losartan on renal and cardiovascular outcomes in patients with type 2 diabetes and nephropathy. N Engl J Med 2001;345:861-9. 95. Pohl MA, Blumenthal S, Cordonnier DJ, De Alvaro F, Deferrari G, Eisner G, et al. Independent and additive impact of blood pressure control and angiotensin II receptor blockade on renal outcomes in the irbesartan diabetic nephropathy trial: Clinical implications and limitations. J Am Soc Nephrol 2005;16:3027-37. 96. Bakris GL, Sarafidis PA, Weir MR, Dahlöf B, Pitt B, Jamerson K, et al. Renal outcomes with different fixed-dose combination therapies in patients with hypertension at high risk for cardiovascular events (ACCOMPLISH): A prespecified secondary analysis of a randomised controlled trial. Lancet 2010;375:1173-81. 97. Krikken JA, Laverman GD, Navis G. Benefits of dietary sodium restriction in the management of chronic kidney disease. Curr Opin Nephrol Hypertens, 2009;18:531-8. 98. Bakris GL, Ruilope L, Locatelli F, Ptaszynska A, Pieske B, de Champlain J, et al. Treatment of microalbuminuria in hypertensive subjects with elevated cardiovascular risk: Results of the IMPROVE trial. Kidney Int 2007;72:879-85. 99. Sato A, Hayashi K, Naruse M, Saruta T. Effectiveness of aldosterone blockade in patients with diabetic nephropathy. Hypertension 2003;41:64-8. 100. Schjoedt KJ, Andersen S, Rossing P, Tarnow L, Parving HH. Aldosterone escape during blockade of the renin-angiotensin-aldosterone system in diabetic nephropathy is associated with enhanced decline in glomerular filtration rate. Diabetologia 2004;47:1936-9. 101. Furumatsu Y, Nagasawa Y, Tomida K, Mikami S, Kaneko T, Okada N, et al. Effect of renin-angiotensin-aldosterone system triple blockade on non-diabetic renal disease: Addition of an aldosterone blocker, spironolactone, to combination treatment with an angiotensin-converting enzyme inhibitor and angiotensin II receptor blocker. Hypertens Res 2008;31:59-67. 102. Mehdi UF, Adams-Huet B, Raskin P, Vega GL, Toto RD. Addition of angiotensin receptor blockade or mineralocorticoid antagonism to maximal angiotensin-converting enzyme inhibition in diabetic nephropathy. J Am Soc Nephrol 2009;20:2641-50. 103. Parving HH, Persson F, Lewis JB, Lewis EJ, Hollenberg NK. AVOID Study Investigators. Aliskiren combined with losartan in type 2 diabetes and nephropathy. N Engl J Med 2008;358:2433- 46. 104. Wenzel RR, Littke T, Kuranoff S, Jürgens C, Bruck H, Ritz E, et al. Avosentan reduces albumin excretion in diabetics with macroalbuminuria. J Am Soc Nephrol 2009;20:655-64. 105. Mann JF, Green D, Jamerson K, Ruilope LM, Kuranoff SJ, Littke T, et al. Avosentan for overt diabetic nephropathy. J Am Soc Nephrol 2010;21:527-35. 107. de Zeeuw D, Agarwal R, Amdahl M, Audhya P, Coyne D, Garimella T, et al. Selective vitamin D receptor activation with paricalcitol for reduction of albuminuria in patients with type 2 diabetes (VITAL study): A randomised controlled trial. Lancet 376:1543-51. Fang, J. and Wei, H. and Sun, Y. and Zhang, X. and Liu, W. and Chang, Q. and Wang, R. and Gong, Y.